Our robot, Eve, is built from the ground up using force-control, enabling human-like dexterity and efficiency. We’d like to discuss why we decided to build Eve this way, hopefully offering another approach to robotics outside the factory floor. Back in 1987, Pål Løken (founder for Halodi Robotics) was attending technical university and witnessed a new generation of industrial robots. People were excited to see cheaper, scaled down commercial robots that were, supposedly, right around the corner. Well, almost 30 years later, and we are still waiting! Pål decided it was time to look into creating a capable, affordable consumer robot, and that’s how we came up with Eve. When we set out to build Eve, we first looked at the classical approach of harmonic-gears and high-speed motors, as it is an established fact that this works exceedingly well for industrial robots. But we realized this would drive up the cost, and limit controllability and final performance of the robot. While incremental improvements and miniaturization have been happening, the fundamental actuator mechanics of robotic manipulators has stayed mostly the same for the last 30 years. Even innovative new collaborative robots still use harmonic gears and high-speed motors for actuation. In gears, one has to choose a balance between backlash and friction and in robotics one typically chooses extremely low backlash to gain good accuracy and repeatability. This results in high friction in the gear itself, and in addition, the friction is scaled by the gear ratio, typically at least 100:1. It is also important to note that friction and backlash is currently not possible to model accurately. When gearing a motor by 100:1, the rotor and shaft need to rotate 100 times faster than the joint. Due to the kinetic energy following the square of the velocity, the inertia get scaled by the square of the gear-ratio, so in this case 10.000. This means even a very light shaft and rotor makes the arm insensitive to external forces. Mechanical backdriveability is defined as direct power-flow from the environment to the motors, and full back driveability, therefore, makes the forces reflected from the environment fully controllable. Backdrivability is limited by the friction and reflected inertia. In traditional robotic control, the lack of backdrivability is used as an advantage. By having a high enough gearing, the joints effectively become highly damped, uncoupled and resistant to external disturbances. This approach then has very good accuracy in position or velocity control but is non-compliant to contact-forces, therefore needing very high accuracy and some passive spring/damper system in the tool. The natural next step is then force-control, which has seen major advancements the last couple of decades, but has stayed mostly within academia, often only as simulated systems, due to the high friction and backlash keeping robots from applying these controllers efficiently. Force-control works by fully handling the differential equations describing the robot and solving them for close to optimal torques needed for each motor to perform a task. This creates much smoother and more energy efficient motions, and can also take into account contact forces. It became clear to us that to handle the case of a home service robot, we needed to fulfill our dream of a full force-control robot, requiring almost full backdrivability in the joints. 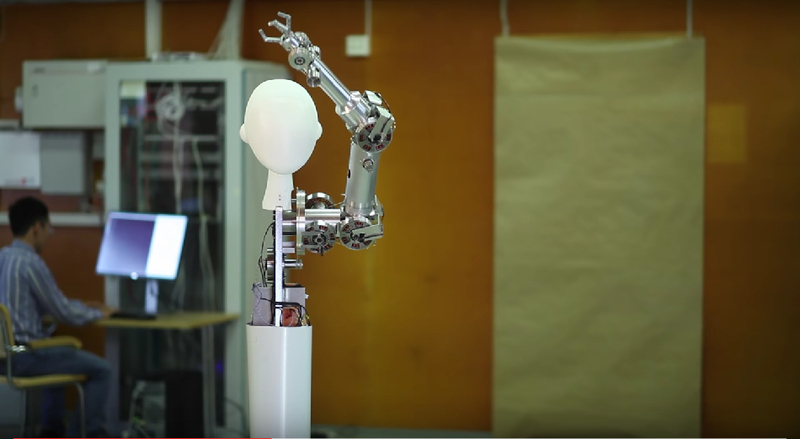 Could a robot arm that is as strong as a human, be built with a very low transmission ratio? While a quick survey of available commercial motors said no, most motors today are optimized for medium to high-speed operation. This is due to the efficiency increasing with the rpm as I²R losses become less significant, this assumption does not hold if one looks at the total system efficiency, though. By having a highly geared system, a lot of the energy is lost as friction and backlash, making the total efficiency no way near the motor efficiency. If we could build a motor with the needed torque, our backdrivability would make the power-flow between the environment and our motors almost loss-less, enabling us to reclaim most of the energy through regenerative braking, offsetting the I²R losses. This is especially true in robotics, as most actions start and end at roughly the same potential energy. Countless hours of books and research papers followed, but in the end, we felt ready to take the next step in motor technology, focusing mainly on torque, not speed. The result was our record-breaking motor technology, managing a torque to weight ratio almost 4x that of any commercially available motor today. With the torque of these motors available, we started developing our REVO-1, drawing inspiration from the field of haptics, we decided on a cable-driven differential transmission. This works by counter-tightening a pair of cables for each transfer, we spent a lot of time making sure the geometry of the cables and the drums they wrap on does not result in any distortion to the cable length, this enabled us to tension the cables to the point where there is essentially zero backlash. Also, the near perfect geometry makes sure the cables never translate on the drums, adding close to zero friction and no sound. The final step was making the joints open differentials, driven by differential cables. In addition to compacting the joints and moving even more mass up the kinematic-chain, this enables pairs of motors to share power — making the robot up to twice as strong! This makes Eve’s friction and inertia low enough that you can move her by gently touching her with a finger. As all the power of the blows is directly transferred to the motors, she can also take almost any shock without sustaining damage! Since we handle the dynamics fully, we also always know how the arm should behave, any deviations from this is then external force, making the entire arm a 7 degree of freedom force/torque sensor (and potentially haptics device). Eve is a quite complicated machine as a sum of her parts, but the mechanics are mainly machined aluminium and steel with quite liberal tolerances and composite cables attached in smart ways. The E-Ink display, FPGAs, IMUs and other sensors are already mass produced and cheap in volume, moving almost all the cost to motors/drivers/encoders. Since these are developed in-house and we have had a focus on manufacturability from the start, we can produce these surprisingly cheap, making us confident that we can reach our cost goal given sufficient volumes. As we started testing, we were pleasantly surprised as tests showed the arm using roughly 2-15W to move without payload (without regeneration). Power consumption is crucial to a mobile untethered robot, and the size of batteries is quite significant to cost. What about today’s collaborative robots, they are also marketed as backdrivable? and “low” gear-ratios (typically still 100+) allowing only large external forces to be transferred. While this works well at low speeds, it cannot mimic the dexterity and speed of the human arm, while interacting with the world. By being truly backdrivable and low friction our robot is mechanically capable of almost any feat, moving the challenge into our control-software. This makes Eve future-proof, and we hope to push forward the boundaries of dexterity and speed in many years to come, in collaboration with academia and the robotics community. What’s next for our robot? We are also currently building version 2 of the Eve prototype, meant for demos and exhibitions, you can follow us for updates along the way!